An event took place in Pokiok sometime in the late 1940s which , although not on equal footing with the sinking of Leacock's Mariposa Belle or the Queen Mary passing through the Suez Canal , nevertheless drew clumps of curious bystanders along its route. 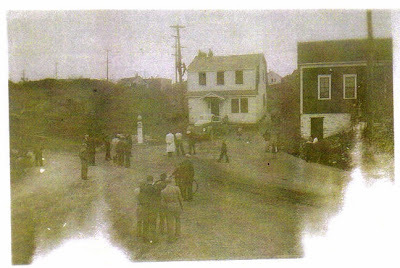 Someone had bought a house on the Boar's Head Road near the airstrip out in Millidgeville and had decided to move it "hollus-bollus" to a vacant lot on Main Street ..... just above the Main Street Baptist Church but on the opposite side of the street...... where it still stands today !! Once jacked up they most likely backed a float underneath the house , made sure the weight was equally distributed and then set out on the long , painstaking trek to its final destination. They came in the Boar's Head Road to Millidge Avenue ..... then in Millidge Avenue , down Belleview Avenue to Pokiok Road and this is where the above pictures show the house as it makes ready to turn the corner beside the Snow Flake Lime Office. The procession moved along at snail's pace with New Brunswick Hydro linesmen removing power lines whenever necessary. In fact , in one of the pics we can see a hydro worker climbing the pole. Looking back now with more mature hindsight I believe they chose the route through Pokiok , up and down Bridge Street and up Main Street rather than the alternate itinerary along Millidge Avenue to Adelaide and then down Main Street...... because following the former they would have fewer power lines to hinder their progress. 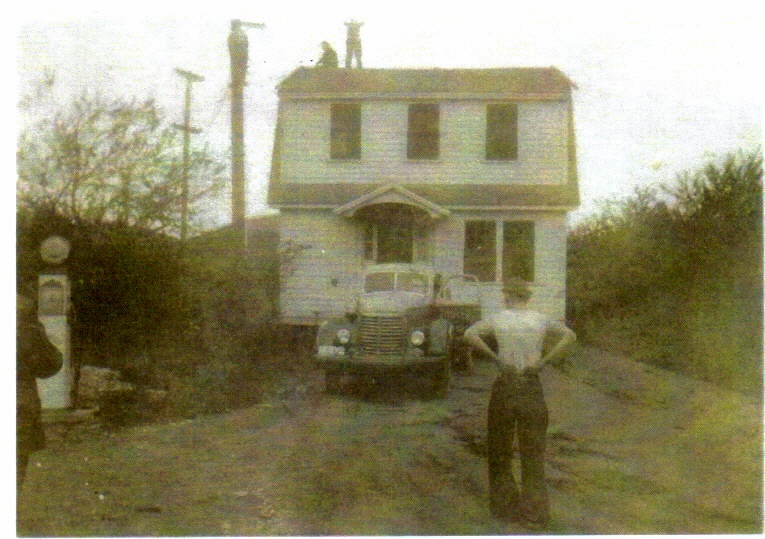 Furthermore , with 1948 ( August 7th) marking the end of the streetcar era in Saint John the low-hanging electric lines had been taken down thereby making it easier to bring the house up Main Street to its final resting place. And here it sits some sixty years later with the present owner Mrs Young and her son , Robert , on front porch. They very graciously and generously took time to pose for the camera a few days ago and are overjoyed to hear from someone who had watched their home inch its way to its present berth..... well maybe only part of the way as I had my newspapers to deliver that day. Since I began this undertaking a few months back I have been relying heavily on my memory and personal pictures but of recent I have renewed contact with a childhood aquaintance who is fast becoming a dear friend and a bottomless source of ideas , blasts from the past we both share along with a goldmine of information and visual material about places , happenings and people we have both loved and respected over the years. His name is Art McGuire , son of Hazel and John , and his surname is synonymous with Pokiok itself. Art and I shall drop by the Young household sometime next week and surprise the Youngs with some snapshots of that Moving Day roughly 60 years ago of which they knew very little. And another day in the peaceful community of Mayberry comes to a close ! What a lovely house and a wonderful story! I love all the old pictures to go with the new. 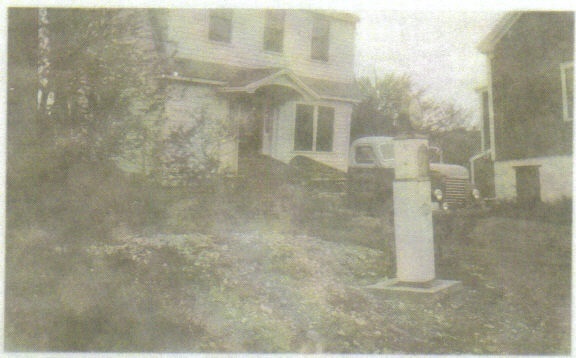 Do you know about the gas pump, is it, out front in the old picture? 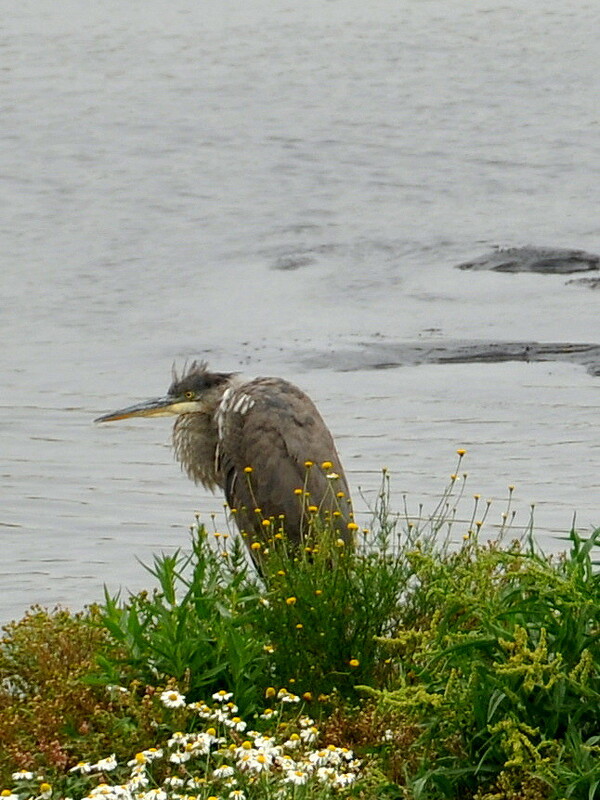 Thank you so much for dropping by , Susan.I have quite a few old pics myself to fall back on with more coming in from friends almost every day. The old gas pump is in all three pics and it belonged to the company Snow Flake Lime ( a huge limekiln just to left of middle pic )However , the local fishermen whose boats were moored nearby could go help themselves , leave an IOU and pay later in the office (building on right in middle pic). People trusted one another back then ! LOL I stood on the exact spot where the old pump stood the other day taking modernday shots of the area...all that's left is the old office building ..... nowadays converted into a private dwelling.Hugs to you and please come back this way again..... P.S. In 1972 I lost $1000.00 in Tulsa. Did you or Larry ever find it ? I really enjoy reading your writings. I was glad you connected with Art McGuire. He is one of my closest friend's, Irene McGuire Maillet, uncle. Her father, of course, would be Lou McGuire. I will continue to check in, hope you never close this blog. Charlotte Doyle Flynn, my niece, told me about it. Your kind words warm my heart , dear Sylvia. I remember you so well but knew you so little.... age difference I guess plus the fact that I was away from home when you were growing up. I have a few more photos up my sleeve to put in here and you are in one of them. Maybe you have a couple you might wish me to put in here .... anything to jog my memory. Only warm feelings well up inside me whenever I think of your Mom and Uncle Stan ... yourself , Paul , Char and Katherine .... Frank and the girls , Connie and Charlotte whom I hardly knew.Anyways , dear Sylvia, I certainly plan to keep on writing up anecdotes , impressions , happenings .... and feelings about Pokiok and the folks who forged its history. Yes, Art McGuire and I get together once a week to reminisce about the past ... and yet go on living in the present.And your friend , Irene, has already come by and left me a warm comment in the About Pokiok section. Please , come back often , dear Sylvia, and feel free to make suggestions or forward to me via email any "brain-joggers" you might think would better this site. Big hugs to you and yours. Click in the box where it says «Select profile». A drop-down list will appear. If you don't have a Google/Gmail account, select either Name/URL or Anonymous from the list. In case Name/URL ... type in your name in the Name box and leave the URL box empty [unless you have a webpage], hit «Continue» and then «Post comment». Left here in 1950 to conquer the world , conquered it and now I'm home to roost... a fit reward for my endeavours.